When city life gets stressful, all we seek is a zone of peace to rejuvenate our chi. Say hello to Koramangala’s newest cafe, Mimansa @ Foxtrot, which combines healthy food and community get-togethers to bring a unique experience to every urbanite. Discover what ‘clean eating’ truly means with food using locally sourced and chemical free ingredients. If you’re watching your health, find plenty of options for vegan free, gluten free, dairy free and sugar free dishes. They ensure Ayurvedic fulfilment through delicious recipes mixing antioxidants such as cocoa and almond, digestion aids (such as ginger and fennel) and immunity and metabolic boosters (including lemon, ginger, fresh mint). Taste the goodness of simple and fresh produce in their mains. Crispy Amaranth Pizzas with feta and zucchini, handmade Aglio-e-Olio and ragi Masala Dosa and idlis. 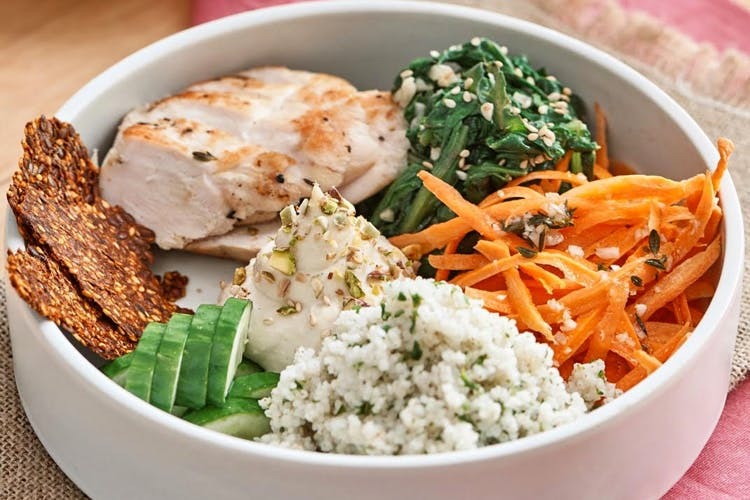 The Earth Bowl with lentils, roast chicken, quinoa, blanched kale and other veggies served with cashew cheese and chia-flaxseed cracker intrigues us. With the cafe opening up as early as 7:30 am, we are sure this could be the newest hub for a satisfying morning brekkie in the area. The innovative folks here offer a refreshing menu with Avocado Toast, Sweet Millet Porridge, Masala Millet Upma, layered Frittata and a whole variety of soups and salads, with green moong dal, blanched almonds and more. Now you can eat without piling on calories!To end meals on a sweet note with guilt free options, there’s buckwheat waffles, carrot halwa with ginger-jaggery sauce and oatmeal crumble, walnut bars and choco-almond brownies. They use jaggery, coconut/palm sugar and honey with almond, chia, buckwheat or whole wheat flour. Hit Mimansa for soul-food any time of the day. With their plans to begin yoga sessions and hosting local Farmer’s Market soon, gather your health-conscious squad of friends to get fitter by the day.